The East Asian Peace: How Did It Happen? How Deep Is It? A distinguished former Korean Foreign Minister, Ro-Myung Gong has been a chair professor in the Division of International Studies of Dongseo University in Busan, Korea, since 2007. He is also Honorary Chairman of the Korea-Japan Forum since after serving as Chairman from 2003 to 2012. He was born on February 25, 1932. He is a graduate of the Law College, Seoul National University and studied at the London School of Economics and Political Science. He entered the Republic of Korea's Ministry of Foreign Affairs in 1958 and served at various overseas diplomatic missions of Korea, including in Washington DC, Tokyo, Canberra and Cairo. He was the Republic of Korea's Ambassador to Brazil from 1983 to 1986, Consul-General in New York (1986-89), Ambassador to the then-Soviet Union (1990-92) and Ambassador to Japan (1993-94), and became Minister of Foreign Affairs from December 1994 to November 1996. After retiring from government, he served as a member of the Presidential Advisory Council on Unification in 1997. He was Director of the Institute of Japanese Studies at Dongguk University, Seoul, from 1997 to 2004, and of the Institute for Japanese Studies at Hallym University in Gangwon, Korea from 2004 to 2007. He was also chairman of the 2010 PyeongChang Olympic Winter Games Bid Committee and chairman of the Sejong Foundation/Sejong Institute from 2008 to 2011. Chung-in Moon is the Editor-in-Chief of Global Asia. He is Special Advisor to the ROK President for Unification, Foreign and Security Affairs. He is also Distinguished University Professor of Yonsei University and Krause Distinguished Fellow, School of Global Policy and Strategy, UCSD. He is Global Chair Professor of the University of Bath, U.K for 2018. He has published fifty six authored, co-authored, and edited volumes and over three hundreds articles in academic journals such as World Politics, International Studies Quarterly, and World Development and edited volumes. He was a Public Policy Scholar of the Woodrow Wilson International Center, a Lixian Scholar of Beijing University, and a Pacific Leadership Fellow at Graduate School of International Relations and Pacific Studies, UCSD. He was executive director of the Kim Dae-jung Presidential Library and Museum. He also served as Chairman of Presidential Committee on Northeast Asian Cooperative Initiative of the Roh Moo-hyun government, a cabinet-level post and Ambassador for International Security of the ROK Ministry of Foreign Affairs and Trade. He attended the first (2000) and second (2007) Korean summit as a special delegate. He was Vice President of International Studies Association of North America (ISA) and President of Korea Peace Research Association. He is currently co-convener of Asia-Pacific Leadership Network for Nuclear Non-proliferation and Disarmament. As an adviser to the governments of Kim Dae-jung and Roh Moo-hyun, he attended the first and second North-South Korean Summits as a special delegate.He was a fellow of the Woodrow Wilson International Center in Washington, D.C., and served as Vice President of the International Studies Association (ISA) of North America and president of the Korea Peace Research Association. He is currently a co-convener of APLN (Asia-Pacific Leadership Network for Nuclear Non-proliferation and Disarmament), co-chair of Korea Peace Forum, chairman of the Asia Research Fund, and a member of the East Asia Foundation. He is a South Korea's representative of the ASEAN Regional Forum Experts and Eminent Persons (ARF-EEPs) and served as co-chair of the first and second AFR-EEPs meetings in June 2006 and February 2007. Veteran financial journalist David Plott has been based in Asia for two decades. He has been a senior adviser to Berita Satu media group in Jakarta, Indonesia since 2007 and played a lead role in founding the Jakarta Globe newspaper for the group in 2008. He also serves as consulting editor for The Edge Review, a Malaysia-based regional weekly focusing on politics, economics and society in Southeast Asia. He worked at the Far Eastern Economic Review (FEER) from 2000 to 2004, serving in his last role as editor-in-chief. He then joined the faculty of the University of Hong Kong's Journalism and Media Studies Centre. As a young man, he reported for the Kansas City Times and the St Petersburg Times in the US before joining Dow Jones Newswires in 1987. In 1994, he transferred to Singapore as news editor for Asian energy and commodities. In 1998, he became senior news editor for Asia-Pacific, with responsibility for 16 regional bureaus. He has an undergraduate degree from the University of California at Berkeley and an MA and PhD from Harvard University. He has taught literature and history at Harvard and at the University of Grenoble in France. Hyung Taek Hong is Executive Director at the East Asia Foundation (EAF) in Seoul, where he oversees planning and implementation of various programs and activities decided by the board of trustees of the EAF. He is a graduate of the Department of Political Science at Korea University in Seoul and holds an MA in political science from the University of Texas at Austin. From 1992 to 1997, he was a lecturer of Korean language at the Department of East Asian Languages and Cultures at Columbia University. Prior to joining the EAF in May 2005, he undertook advanced graduate studies in Political Science at Columbia University in the City of New York, majoring in comparative politics, international relations and Russian area studies. John Nilsson-Wright is the Fuji Bank Senior University Lecturer in Modern Japanese Studies and an official fellow of Darwin College, Cambridge. His current interest focuses on contemporary political and security interests in Northeast Asia, with particular reference to Japan and the Korean peninsula. In addition to his work at Cambridge, he is an Associate Fellow at Chatham House, where he convenes a research and discussion group on contemporary Korea. A graduate of Christ Church, Oxford University, and the Nitze School of Advanced International Studies (SAIS) at Johns Hopkins University in Washington, DC, he has a DPhil in International Relations from St. Antony's College, Oxford. Park Cheol-Hee is a professor at the Graduate School of International Studies (GSIS) at Seoul National University. He is also director at the Institute for Japanese Studies at the university. His interest lies in contemporary Japanese party politics and comparative policy processes and international relations in East Asia. His recent research has focused on Japan-Korea relations and comparative study of the Korean and Japanese political systems. His prior posts include assistant professor at the National Graduate Institute for Policy Studies and, from 2002 to 2004, assistant professor at the Institute for Foreign Affairs and National Security. He has a BA and MA in Political Science from Seoul National University. In 1998, he earned a PhD in Political Science from Columbia University. Satu Limaye is a director of the East-West Center in Washington and an editor of its Policy Studies series. He studied for a BA at Georgetown University's Edmund Walsh School of Foreign Service, then earned a Ph.D. in international relations at Oxford University's Magdalen College as a Marshall Scholar. Prior to joining the East-West Center, he was a member of the research staff at the Institute for Defense Analyses in Alexandria, Virginia. 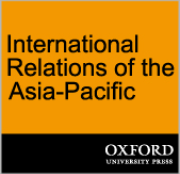 He has written and edited numerous books, monographs and studies focusing on international political, economic and security relations of the Asia-Pacific region. Wang Yong is a professor at the School of International Studies, Peking University. He is also Director of the Peking University Center for International Political Economy Research. His primary research interests concern international political economy, the politics of the WTO and other international economic institutions, and regional integration in East Asia as well as US-China relations. He tries to illuminate the relations between state and market on both global and domestic levels. His current interest concerns the changes produced by economic globalization and the impact on China's economic and political policy making. John Delury is an assistant professor of East Asian Studies at Yonsei University's Graduate School of International Studies and Underwood International College in Seoul. John received his BA and PhD in History from Yale University. Before moving to Seoul, John taught Chinese history and politics at Brown, Columbia and Peking Universities, and was associate director of the Center on US-China Relations at the Asia Society in New York. He is a senior fellow of the Asia Society's US-China Center, a term member of the Council of Foreign Relations, member of the National Committee on North Korea, and sits on the 21st Century Leadership Council of the National Committee on American Foreign Policy. He follows Northeast Asian relations and North Korean affairs closely, and his newest article, "The Disappointments of Disengagement: North Korea Policy under Obama." 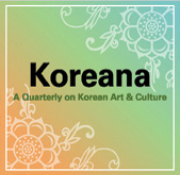 is in the spring issue of Asian Perspective. His writings have also appeared recently in Foreign Affairs, Foreign Policy and Yale Global Online. His book on modern Chinese history, Wealth and Power: China's Long March to the 21st Century, co-authored with Orville Schell, was published by Random House in 2013. Taehwan Kim is Associate Professor of Public Diplomacy of the Korea National Diplomatic Academy (KNDA), the ROK Ministry of Foreign Affairs. Before joining KNDA in 2013, he had served as Director of Public Diplomacy at the Korea Foundation since 2008, and has also been Managing Director of the East Asia Foundation since its establishment in 2005. He worked as Research Professor at the Division of International Education of Yonsei University since 2002. He also served as Research Director at the Korean Political Science Association (KPSA) in 2009 and at the Korean Association for Slavic Studies (KASS) in 2008-2009. He graduated from Yonsei University (B.A. and M.A. in Political Science) and received his PhD in Political Science from Columbia University with area specialty in Russia and theoretical specialty in Political Economy. His recent research focus is on comparative political economy of post-socialist transformation in such countries as Russia, China, North Korea, Belarus, and Central Asia. Among his recent writings are Autocratic Resistance to Economic Reforms: Political-Economic Rents and Reform Resistance in Turkmenistan, Uzbekistan and North Korea; Impassive to Imperial? Russia in Northeast Asia from Yeltsin to Putin;Delegating Property Rights: A Property Rights Approach to Economic Reforms in the Soviet Union, Russia, China, and North Korea; Recombinant Capitalism: Fragmented State and Associated Economy in Post-Socialism; he also co-authored South Korea's International Relations with Dr. Chung-in Moon. He was awarded the Korea Research Foundation's 2003 Junior Scholar Research Promotion Grant. Odd Arne Westad is the S.T. Lee Professor of U.S.-Asia Relations at Harvard University, where he teaches at the Kennedy School of Government. He is an expert on contemporary international history and on the eastern Asian region. Before coming to Harvard in 2015, Westad was School Professor of International History at the London School of Economics and Political Science (LSE). While at LSE, he directed LSE IDEAS, a leading centre for international affairs, diplomacy and strategy. Professor Westad won the Bancroft Prize for The Global Cold War: Third World Interventions and the Making of Our Times. The book, which has been translated into fifteen languages, also won a number of other awards. Westad served as general editor for the three-volume Cambridge History of the Cold War, and is the author of the Penguin History of the World (now in its 6th edition). His most recent book, Restless Empire: China and the World since 1750, won the Asia Society’s book award for 2013. Professor Westad’s new book, The Cold War: A World History, will be published in 2017 by Basic Books in the United States and Penguin in the UK. A new history of the global conflict between capitalism and Communism since the late 19th century, it provides the larger context for how today’s international affairs came into being. Barry Eichengreen is the George C. Pardee and Helen N. Pardee Professor of Economics and Professor of Political Science at the University of California, Berkeley, where he has taught since 1987. He is a Research Associate of the National Bureau of Economic Research (Cambridge, Massachusetts) and Research Fellow of the Centre for Economic Policy Research (London, England). He is the convener of the Bellagio Group of academics and economic officials and chair of the Academic Advisory Committee of the Peterson Institute of International Economics. He is also a regular monthly columnist for Project Syndicate. He is a fellow of the American Academy of Arts and Sciences (class of 1997). He has held Guggenheim and Fulbright Fellowships and has been a fellow of the Center for Advanced Study in the Behavioral Sciences (Palo Alto) and the Institute for Advanced Study (Berlin). In 1997-98 he was Senior Policy Advisor at the International Monetary Fund. He was awarded the Economic History Association's Jonathan R.T. Hughes Prize for Excellence in Teaching in 2002 and the University of California at Berkeley Social Science Division's Distinguished Teaching Award in 2004. He has also recieved the title of doctor honoris causa from the American University in Paris. Choong Yong Ahn is a chair professor of the Graduate School of International Studies at Chung-Ang University, Seoul. He is also Foreign Investment Ombudsman at Korea Trade and Investment Promotion Agency and a member of the Korean National Competitiveness Council. He served as the managing editor of the Journal of Economic Development of Chung-Ang University. He was President of the Korea Institute for International Economic Policy (KIEP) from January 2002 to January 2005 and served as the Chair of the APEC Economic Committee and a member of the Korea's Presidential Economic Advisory Council. He has maintained a keen interest in public policy, serving in positions such as consultant to the World Bank, UNIDO Chief Technical Advisor to the Economic Planning Unit of Malaysia (regarding the design of Malaysia's industrial master plan), and as president of several academic societies in Korea. He has also received honors including an Economist of the Year award from the Maeil Economic Daily in Korea, the Okita Policy Research Award by the National Institute for Research Advancement in Japan and the Free Economy Publication Award by the Federation of Korean Industries in 2002. Dr Ahn earned his PhD from Ohio State University in 1972. He has published many articles in international journals. Affairs at Princeton University in the Department of Politics and the Woodrow Wilson School of Public and International Affairs. He is also Co-Director of Princeton's Center for International Security Studies, a Global Eminence Scholar at Kyung Hee University in Seoul, Korea, and in 2013-14 he is also an Eastman Visiting Professor at Balliol College, Oxford University. He is the author of six books, the latest of which is Liberal Leviathan: The Origins, Crisis, and Transformation of the American System. He has edited or co-edited 14 other books, has lectured throughout the United States, Europe, and Asia and is a reviewer of books on political and legal affairs for Foreign Affairs magazine. Professor Ikenberry received his PhD from the University of Chicago in 1985. He served as a member of the Policy Planning Staff in the US State Department in 1991-92 and was a senior associate at the Carnegie Endowment for International Peace in 1992-93, where he served as a senior staff member on the 1992 Carnegie Commission on America and a Changing World. He taught at Georgetown University and the University of Pennsylvania from 1993 to 1999. He has also been a Non-resident Senior Fellow at the Brookings Institution (1997-2002). He served as a member of a State Department advisory group in 2003-04, and as a member of the Council on Foreign Relations Task Force on US-European relations, the so-called Kissinger-Summers commission, which issued a report in 2004. Tan Sri Mohamed Jawhar Hassan is Chief Executive of the Institute of Strategic and International Studies (ISIS) Malaysia, having joined as Deputy Director-General in 1990, becoming Director-General in 1997 and Chairman since 2006. He earlier served in government positions, including Director-General of the Department of National Unity; Under-Secretary in the Ministry of Home Affairs; Director (Analysis) Research Division in the Prime Minister's Department; and Principal Assistant Secretary of the National Security Council. He also served as Counselor in the Malaysian Embassies in Indonesia and Thailand. He was Project Co-ordinator of Malaysia's Master Plan on Knowledge-Based Economy, helped draft the Report of the Royal Commission to Enhance the Operation and Management of the Royal Malaysian Police, and was also the lead drafter of the Islamic Development Bank's Vision 1440 Hijrah document. Tan Sri Jawhar has served as a member of Penang Knowledge Economy Information Communications Technology Council (K-ICT Council) since its inception. He was heavily involved in formulating a K-ICT Blueprint in support of the government's goal of making Penang a fully developed state by 2010. His other positions include: Member, Economic Council; Member, National Unity Advisory Panel, Malaysia; Non-Executive Chairman, New Straits Times; Co-Chair, Network of East Asia Think-tanks (NEAT) 2005-2006; Chairman, Malaysian National Committee, Pacific Economic Cooperation Council (PECC); Co-Chair, Council for Security Co-operation in the Asia Pacific (CSCAP) for a period of two years; Chair, ASEAN-ISIS (2007-2008); ASEAN Regional Forum Expert and Eminent Person; Member of the Board of Directors, International Institute of Advanced Islamic Studies; and Distinguished Fellow, Institute of Diplomacy and Foreign Relations, Ministry of Foreign Affairs, Malaysia. Nayan Chanda is the Director of Publications at the Yale Center for the Study of Globalization and the Editor of Yale Global Online, an online magazine focused on exploring globalization. Chanda began a journalistic career in 1974 by joining the Hong Kong-based magazine Far Eastern Economic Review (FEER) as its Indochina correspondent, later becoming its diplomatic and then Washington correspondent. International Peace in Washington, and in 1990 became Editor of the Asian Wall Street Journal Weekly, published from New York, and later Editor of FEER. He is the author of Brother Enemy: The War After the War, a seminal study of post-Vietnam War Indochina, and The Age of Terror: America and the World After September 11. His most recent book is Bound Together: How Traders, Preachers, Adventurers and Warriors Shaped Globalization. He was the 2005 recipient of the Shorenstein Award, which recognizes a journalist's contribution to helping American audiences understand the complexities of Asia. Distinguished Russian scholar Nodari Simonia is is currently a professor at the International Institute of Energy Policy and Diplomacy at MGIMO University, Moscow. He is a full member of the Russian Academy of Sciences and has been an adviser to the academy since 2007. Simonia graduated from the Moscow State Institute in 1955. He rose to become Head of the Institute of Oriental Studies at the Academy of Sciences of the USSR from 1958 to 1988. Since then he has been Deputy Director of the Institute of World Economy and International Relations (IMEMO), which is under the charter of the Academy of Sciences. He also served as Director of IMEMO from 2000 to 2006, then as Head of its Center for Energy Studies from 2006 to 2010. He is currently a member of the Interdepartmental Committee on International Relations of the Russian Security Council, a member of the Scientific Council of the Russian Ministry of Foreign Affairs and a member of the European Academy of Sciences, Arts and Letters in Paris. In 2001-2006 he was special representative of the Russian president for relations with leaders of African countries in the G8 framework. He participated in G8 summits in Kananaskis (2002), Evian (2003), Sea Island (2004), Gleneagles (2005). His research interests and scope include globalization and multi-polarity, Russian history and politics, the social and economic development of modern Russia, international national liberation movements, revolution and reform in Eastern countries and problems of world energy. He has authored or co-authored hundreds of scientific publications, papers and books, among the most well-known of which is the theoretical monograph The Countries of the East: the Path of Development. During his time at IMEMO he has also been Director of the Center for Comparative Studies of Russia and the Third World, Head of the Department of Socio-Economic Problems of Developing Countries and head of a sub-department studying Asia and North Africa. His career has also included periods as a visiting assistant professor in the Institute of Social Sciences, Moscow (1980), and visiting professor of Politics, Novosibirsk University. Peter Hayes is the Director of the Nautilus Institute for Security and Sustainable Development, a non-governmental policy-oriented research and advocacy group, and an Adjunct Professor of International Relations at the Royal Melbourne Institute of Technology. An active environment and energy consultant in developing countries (working for United Nations Environment Programme, Asian Development Bank, World Bank, Canadian International Development Research Council, US Agency for International Development and United Nations Development Program), he also writes widely about security affairs in the Asian-Pacific region and has been a frequent visitor to North Korea. He was first the founding director of the Environment Liaison Centre in Nairobi, Kenya, in 1974-76. He was Deputy Director of the Australian Government's Commission for the Future from 1989-1991. He is a member of the Pacific Council on International Policy, the Western partner of the Council on Foreign Relations; and the US Committee of the Council for Security Co-operation in the Asia Pacific. Peter graduated with degree in History from the University of Melbourne, and has a doctorate from the Energy and Resources Group at the University of California at Berkeley. He was awarded a MacArthur Fellowship in 2000. Stein Tønnesson is a Norwegian historian who is currently leader of a program on East Asian peace studies at Uppsala University, Sweden. 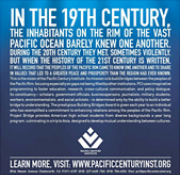 The course focuses on the relative peace prevailing in East Asia since 1979. From 2001 to 2009, he served as Director of the International Peace Research Institute, Oslo (PRIO). While in that role he engaged in dialogue work in Cyprus and in studies of energy dependence and Middle East policies, of global counter-terrorism strategies, and of the causes behind global and regional trends from 1992 to 2003 towards less murderous warfare. He was trained as a historian, and has in particular worked on East Asia. His doctoral thesis, defended at the University of Oslo in 1991, was on the international history of the Vietnamese revolution in 1945, and he has recently been working on a manuscript for the University of California Press on Vietnam 1946: How the War Began. He has also served as consultant to several Norwegian companies (StatoilHydro, Telenor, Norske Skog) and is a frequent commentator in the Nordic and international media on international affairs. He is also the author of a textbook in contemporary history for Norwegian secondary schools. W. Lee Howell has been Managing Director of the World Economic Forum since 2009 and a member of its Managing Board since 2011. He first joined the WEF in 2001 as Director of its Annual Meeting Program, and after leaving to be a Senior Advisor to the Bureau for Policy and Program Coordination in the United States Agency for International Development (USAID) in 2002-03, he rejoined the WEF as Senior Director and Asia Head in 2004. He also was an Adjunct Fellow at the New America Foundation and the Pacific Forum of the Center for Strategic and International Studies (CSIS) and a consultant to international business organizations. He began his career in international affairs as a Fellow at CSIS, DC from 1993-1996, where he managed the research, media and corporate programs related to Japan and South Asia. From 1996 to 1999 he was based in New York as director of the corporate and public policy programs at the Japan Society, a leading American non-profit organization focusing on economic, cultural and political developments in Japan and East Asia. He then worked as a consultant to the United Nations High Commissioner for Refugees in Geneva, where he was responsible for developing a major UNHCR initiative ("Imagine Coexistence") on the sustainable repatriation and reintegration of refugees to communities scarred by ethnic violence. He is a graduate of the University of Maryland in College Park and received his Masters of Law in International Legal Studies (LLM) from the Washington College of Law at American University. Wang Jisi has been President of the International Studies Institute of Peking University and director of the university's Center for International and Strategic Studies since 2005. He has been a member of the Foreign Policy Advisory Committee of China's Foreign Ministry since 2008, and president of the Chinese Association for American Studies since 2001. A Han native of Guangzhou, Wang was born in 1948, and obtained a master's degree at Peking University in 1983. He taught in Peking University's Department of International Politics from 1983 to 1991, and then served as director of the Institute of American Studies at the Chinese Academy of Social Sciences until 2005. He was also director of the Institute of International Strategic Studies at the Central Party School of the Communist Party of China from 2001 to 2009. In the 2010-11 academic year he was a visiting scholar at Princeton University. He is guest professor of the National Defense University of the PLA, President of the Chinese Association for American Studies, a founding member of the Pacific Council on International Policy in Los Angeles, International Council Member of the Asia Society in New York, and a member of the advisory council at the Center for Northeast Asian Policy Studies of the Brookings Institution in Washington DC. He is also an advisor of the Asia Center at Harvard University and serves on the Board of Directors of the nonprofit organization Teach For China. Wang's interests cover US and Chinese foreign policy and Asian security. Foreign Policy magazine named Wang one of its 2012 Top 100 Global Thinkers. Wonhyuk Lim is Director of Global Economy Research at the Korea Development Institute (KDI), Seoul. Since joining in 1996, his research has focused on state-owned enterprises and family-based business groups (chaebol). He has also written extensively on development issues, in conjunction with policy consultation projects under Korea's Knowledge Sharing Program (KSP). He received a Presidential order from the Dominican Republic for his work. After Korea's 2002 Presidential Election, he worked for the Presidential Transition Committee and the Presidential Committee on Northeast Asia and helped to set policy directions for the restructuring of the electricity and gas sector and for Northeast Asian energy cooperation. Dr. Lim was also at the Brookings Institution as a CNAPS Fellow for 2005-06, and worked as a consultant for the World Bank and the Asian Development Bank Institute (ADBI). Most recently, he helped to formulate the G-20 Seoul Development Consensus for Shared Growth. Among his recent publications are Joint Discovery and Upgrading of Comparative Advantage: Lessons from Korea's Development Experience and Global Leadership in Transition: Making the G-20 More Effective and Responsive. He holds a Bachelor of Applied Science in Physics and History and a PhD in Economics from Stanford University. Yoichi Funabashi is Chairman of the Rebuild Japan Initiative Foundation and a former chief diplomatic correspondent and columnist for the Japanese newspaper The Asahi Shimbun. He is a contributing editor of Foreign Policy magazine, published in Washington, DC. He is the author of several prize-winning books and was awarded the 1985 Vaughn-Uyeda Prize – often called Japan's Pulitzer Prize – for his coverage of US-Japan trade frictions. He was also granted the Sakuzo Yoshino award for the Japanese version of Managing the Dollar: From the Plaza to the Louvre (revised edition, 1989). He is also the author of Asia-Pacific Fusion: Japan's Role in APEC (1995), which was awarded the Asia-Pacific Grand Prix Award. He received his BA from the University of Tokyo in 1968 and his PhD from Keio University in 1992. Yoshihide Soeya is Professor of Political Science and International Relations in the Faculty of Law of Keio University. He also serves as Director of the university's Institute of East Asian Studies. His areas of interest are politics and security in East Asia, and Japanese diplomacy and its external relations in the region and the world. In 1999-2000 Dr. Soeya served as a member of the Prime Minister's Commission on Japan's Goals in the 21st Century, and in 2010 he was a member of the Council on Security and Defense Capabilities in the New Era, both in the Prime Minister's Office. He received his PhD from the University of Michigan in 1987, majoring in world politics. Gareth John Evans is an Australian international policymaker and former politician. An academic lawyer and barrister by profession, he represented the Australian Labor Party in the Senate and House of Representatives from 1978 to 1999, serving as a Cabinet Minister in the Hawke and Keating governments from 1983 to 1996 as Attorney-General, Minister for Resources and Energy, Minister for Transport and Communications and most prominently, from 1988 to 1996, as Foreign Minister. He was Leader of the Government in the Senate from 1993 to 1996, Deputy Leader of the Opposition from 1996 to 1998, and remains one of the two longest-serving federal Cabinet Ministers in Labor Party history. After leaving politics, he was President and Chief Executive Officer of the Brussels-based International Crisis Group from 2000 to 2009. On returning to Australia he was appointed in 2009 honorary professorial fellow at the University of Melbourne. He has served on a number of major international commissions and panels, including as co-chair of the International Commission on Intervention and State Sovereignty (2000-2001) and International Commission on Nuclear Non-proliferation and Disarmament (2008-2010). Since 2010, he has been the Chancellor of the Australian National University (ANU). He was appointed an Honorary Professorial Fellow at the ANU in 2012. Lee Hong-koo has had a long and distinguished career in academia, government, and politics, including serving as Prime Minister of South Korea. After graduating from Oxford College in 1957 and Emory University in 1959, he received a PhD in political science from Yale University and went on to hold professorships at Emory, Case Western Reserve University, and Seoul National University. His early government service included appointments as Minister of National Unification (1988) and Ambassador to the United Kingdom (1991). He was Prime Minister from 1994 to 1996 in President Kim Young Sam's government, and in 1998, at the height of the Asian financial crisis, he was posted to Washington as Ambassador to the United States. Dr Lee currently serves as chairman of the Seoul Forum for International Affairs. After decades in India and international public service, N.K. Singh is currently a Member of Rajya Sabha (the Upper House of India's Parliament) from the State of Bihar. He has held senior civil service positions in the Ministries of Finance & Economic Affairs and Expenditure & Revenue Secretary, as well as in the Ministry of Home Affairs. He served as Secretary to the Prime Minister and was a Member of the National Planning Commission as well as Deputy Chairman of the Bihar State Planning Board. He has held advisory and leadership positions at the United Nations. He represented India in successive delegations to the World Bank, International Monetary Fund, Asian Development Bank, World Intellectual Property Organization and United Nations Development Program. He served as the Minister (Economic and Commercial) at the Indian Embassy in Tokyo during a critical time in the countries' bilateral relationship. He graduated in economics from St Stephens College, Delhi and went on to do his Masters from the Delhi School of Economics before becoming an IAS Officer. He is a regular panelist and faculty member at the World Economic Forum, a frequent lecturer at Universities around the world, and a regular contributor to Indian and international media on economic and policy matters. As a Member of Parliament, Mr. Singh is a member of the Public Accounts Committee, the Committee on Public Undertakings, the Standing Committee on Education, Parliamentary Consultative Committee on Finance and Parliamentary Forum on Global Warming & Climate Change. He serves on the board of research organizations including ICRIER (the Indian Council for Research and International Economic Relations), the International Management Institute and the Observer Research Foundation, and is co-Chairman of the India Advisory Board of London School of Economics and member of the India Advisory Board of Columbia University. He is a member of the Governing Board, Nalanda International University. Yoriko Kawaguchi is a member of the House of Councillors (the upper house of the Diet) of Japan, and a member of its Standing Committee on Environment. She served as Minister of the Environment between 2000 and 2002 and as Minister for Foreign Affairs between 2002 and 2004. Subsequently she was appointed as a Special Advisor to the Prime Minister, responsible for foreign affairs. A former economist at the World Bank, she held the position of Minister in the Embassy of Japan, United States, in 1990. Between 1992 and 1993 she was Director-General of Global Environmental Affairs at the Ministry of International Trade and Industry (now the Ministry of Economy, Trade and Industry). Together with former Australian Foreign Minister Gareth Evans, Ms Kawaguchi co-chaired the International Commission on Nuclear Non-Proliferation and Disarmament. She holds a BA in international relations from the University of Tokyo and a master's degree in economics from Yale University. She is also a recipient of the Wilbur Cross Medal, a Yale University award for distinguished public service.